In a shallow dish, beat the egg. Lay the slice of bread in the egg and leave for 30 seconds or so, then flip and do the same with the other side. The bread should absorb most of the egg. Heat a non-stick frying pan over a medium heat and lay the bread in the pan* Cook for 2-3 minutes on each side, until lightly golden and cooked through. Whilst the bread is cooking, mix the strawberries with the ricotta. 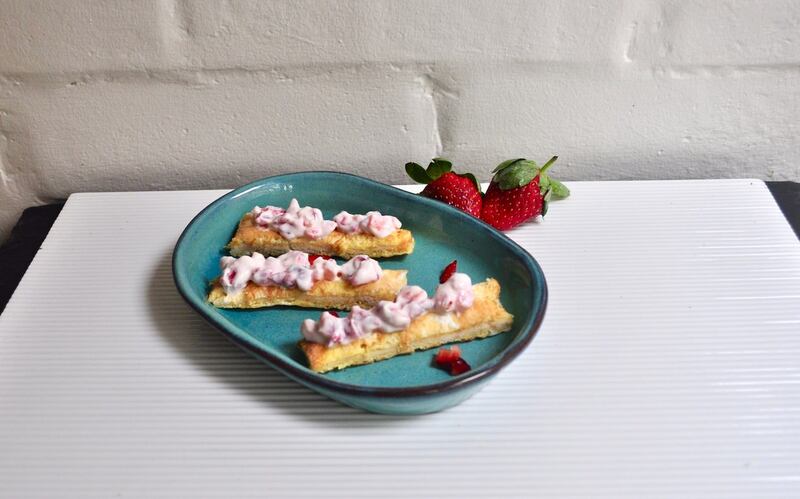 Cut the bread into fingers or shapes or your choice, and top with the strawberry ricotta. *I have a fairly new non-stick pan so don't need to use any oil/fat. Use about 1/2 tsp oil if you need to.